Post subject: ECU Catch codes! Q: Where do I find the my ECU? 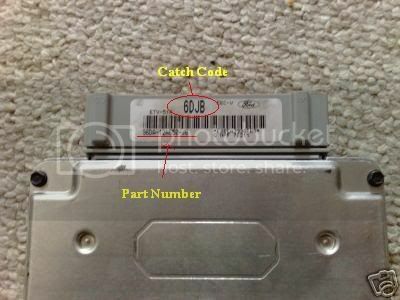 Q:Where on the item is my Catch Code? A: On the sticker facing the front guard, you have to remove it. I'll start off what I have! 4DBD....94DA-12A650-BD. cop or not xr6 or not... no idea! Thats it so far. Try and copy and paste this list and add to it so its neat and easy to read. here is my collection so far..
6DAB. this is what mine is. EL Falcon XR6, 2.5in exhaust, extractors, ported throttle body, sequential intake, CMS stage 2 head. Tickford cam!!!!! 4TAC 1995 EF XR6 Manual. Lot of catch codes for one car. What is a catch code for anyway? its definatly not a ef xr6 ecu. its a std el fairmont auto ecu . i think this guy on ebay has no idea..
lol it wont even fit into a ef. yeah I know, but he should have a idea now I sent him the relevent info, nicely too.